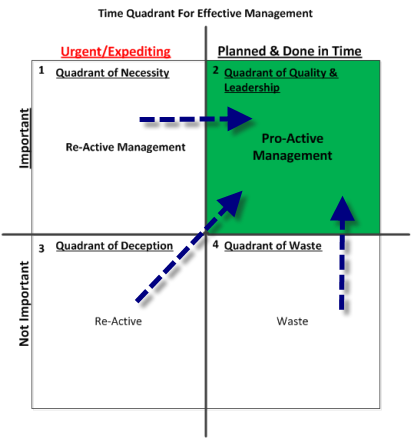 How does managing time properly, contribute to individuals and organisations being more effective? I ask this question because it is one of those areas that people talk about often but implement seldom. How often do you see deadlines not being met? This not an uncommon situation even in organisations that appear to be doing very well financially. So if you or your organisation is missing deadlines then you are part of a much larger community and you can do something about it. Important work is forced on us, we have no choice we just have to get it done. 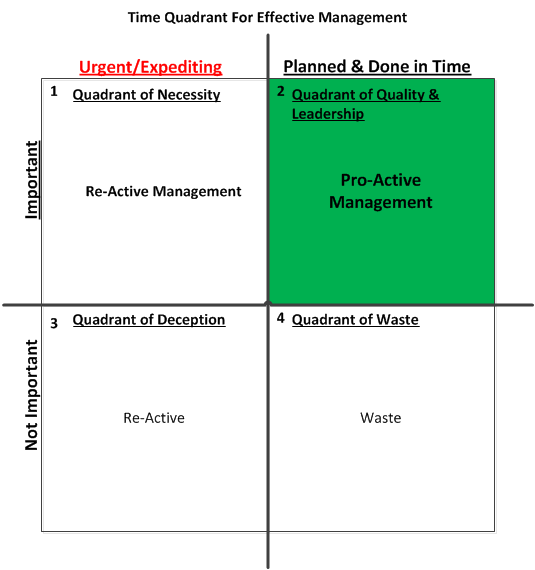 Many of my clients are operating in this quadrant and quadrant 3when I start with them. People are constantly re-acting to crisis situations. Recrimination is common, courtesy and respect are often in short supply due to stress. Deadlines are seldom achieved and when they are achieved it is at the cost of quality or scope resulting in less than satisfactory outputs and outcomes. I recommend that if you are working on important and urgent activities for a significant part of your day then it is time to change how you plan your life, your beliefs and the culture of your organisation. Important work is planned and done in time. If you and your organisation have got to this level, well done. Any activity you do that has nothing to do with you being productive over the next couple of months. In order to get individuals and the organisation to start utilising their time more effectively you need to change how they see the world around them. The organisation needs to change its culture. Start this change by getting everyone to work towards a common goal. Develop a strategy and tactics tree to establish what is important and in what order to carry out activities and establish what results can be expected at each step. Once you have started the process of changing people’s beliefs and getting them to take the appropriate actions you will be well on your way to optimising the use of your limited time. This will result in an increase in your production capacity. Everyone in the organisation must know what the organisation’s goal is. There is a clear understanding as to what necessary conditions and critical success factors need to be fulfilled in order to achieve the goal. Will focus on high leverage capacity building activities. Who look for opportunities to be ahead in their market space. Who ensure their teams keep up with technological changes. Producers will know what the required end result is and focus on completing each activity in the right sequence, at the appropriate level of quality and generally as soon as possible, so that they can commence with the next activity. Who take the time to learn a little more each day within their field and keep up with changes. Balance between productivity and production capacity. All members of the organisation have a clear understanding as to what is expected of them as individuals and from the team.